I think Zooropa was the first U2 album I ever bought. I vaguely recall having heard Numb on what was then called 93 FM and thinking it sounded pretty cool. Then on a trip later to Taupo with my Dad and brothers I saw a poster with all the song titles on it and it looked awesome and dangerous unlike say the Roxette album we listened to on the way to Taupo. Soon after I bought the album and my musical journey with U2 began. Anyways you didn't come here for the memories of a teenager, you came for the lyrics of Zooropa, a Grammy award winning album that featured a monotoned The Edge, an amazing vocal track by the late and great Johnny Cash and some fantastic Brian Eno keyboard magic on Lemon. 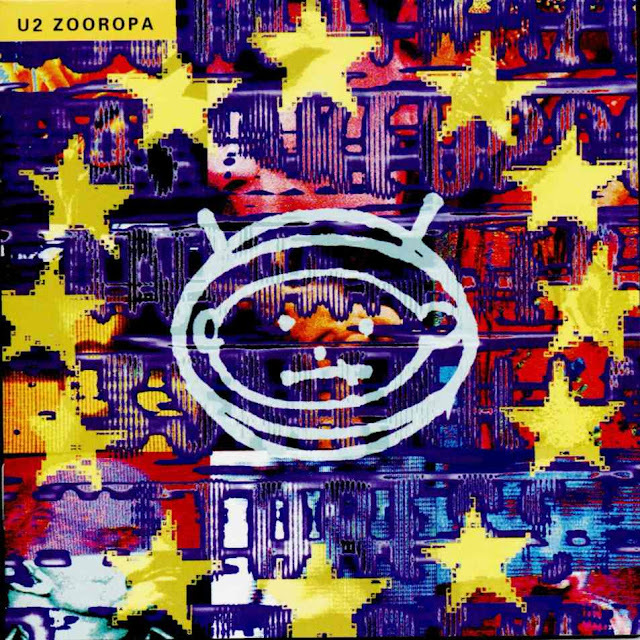 Zooropa was a quick companion piece of sorts to Achtung Baby. Lyrically, Zooropa expanded on many of the Achtung Baby tours' themes of media over-saturation, technology, and of course love. 5. "Stay (Faraway, So Close!)" 6. "Daddy's Gonna Pay for Your Crashed Car"
7. "Some Days Are Better Than Others"
Hold Me, Kiss Me, Kill Me, Thrill Me was also written during the recording sessions for Zooropa, however it was considered to different from the other songs to warrant a place on the album and somehow it found its way onto the Batman Forever movie soundtrack.